Dental implants are the best option for replacing missing teeth. This is because implants are a safe and permanent solution for this problem, and they offer several advantages over dental bridges and dentures. The process of placing a dental implant is quite simple, and unlike bridges or dentures, the results often last a lifetime. First, Dr. Khazian will examine your teeth and take images of your jaw to determine if you are a good candidate for an implant. He will then place the dental implant in your jaw. In a few weeks, the jaw bone heals over the titanium implant, forming a solid bond. Once the implant site has healed, Dr. Khazian will restore the implant with a crown, replacing the missing tooth. Dental implants look, feel, and function like natural teeth. Implant teeth can be cared for just like a natural tooth, with brushing and flossing, and you can continue to enjoy all your favorite foods without fear of the implant slipping or falling out. 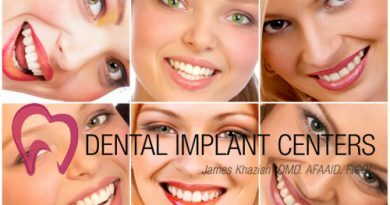 Dr. Khazian, The leading San Diego dental implants expert, offers free consultations with patients who are considering having dental implants. Dr. Khazian has successfully placed thousands of dental implants to help restore patients’ smiles. To schedule your complimentary consultation, contact Dental Implant Centers at (866)469-7645.